Do you own a business or manage a commercial property? 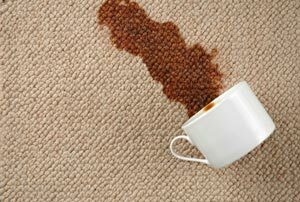 If so, you’ve probably had the experience of trying to clean up after an employee or tenant who spilled or tracked something on the carpet, but the stain didn’t come out completely. Or maybe you are noticing heavy traffic areas becoming quite dark. It’s even possible that the carpet isn’t staying clean for very long after it’s been “professionally” cleaned and the stains are reappearing. Is there a commercial carpet cleaning solution to these and other concerns? 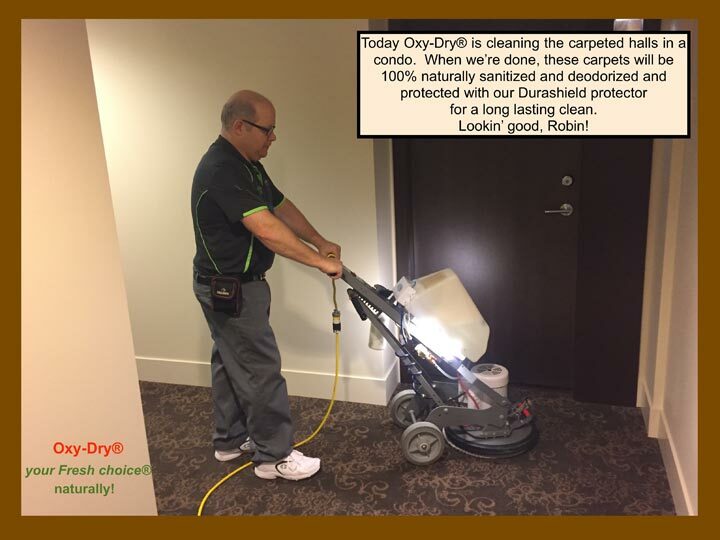 Oxy-Dry® is an ultra low moisture system that utilizes specialized cleaning equipment and bio-degradable, environmentally friendly, green seal certified cleaning products when cleaning commercial carpets. Oxy-Dry® will eliminate your commercial carpet problems such as wicking, recurring spots, traffic lanes, blotchy appearance, rapid re-soiling, and long dry times. How? Well first, you should understand why some of these problems may occur. Systems that use an excessive amount of water, such as hot water extraction (steam cleaning), will drive the soil and stains deep down into the backing of the carpet or deeper. Not all the dirty water is vacuumed out and so as the carpet dries (usually 12-24 hours), the soil and stains will “wick” back to the surface and your carpet will look dirty again. Other systems may have the same effect due to sloppy or inexperienced cleaning technique or the use of inferior and inadequate products. In addition, if you, the customer, didn’t agree to receive the full treatment that includes all the options, your carpet may experience problems due to an improper cleaning. 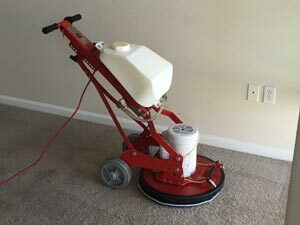 Another system, called “encapsulating,” scrubs the carpet, driving the soil into the backing, and leaves the crystalized or encapsulated soil there for the customer to remove later, during the next scheduled vacuuming. Repeated use of this system can result in a build up of soil in the carpet backing, producing chronic and rapid re-soiling. 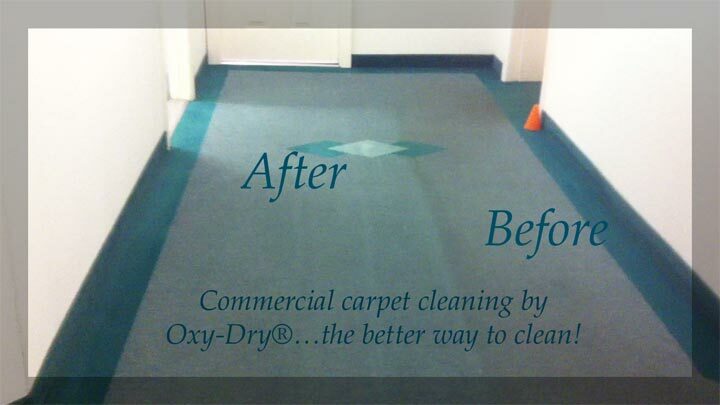 If you want a proper, professional and lasting clean, Oxy-Dry® is the answer. Our exclusive oscillating process incorporates 1750 cleaning passes per minute, lifting and extracting deep down soil and stains for truly effective commercial carpet cleaning. We always include everything in our cleaning to ensure a better clean. Our exclusive Ozone Boost System will naturally eliminate all germs, bacteria and viruses on contact. It will also eliminate most odours without adding an odour and that means our system is odourless! Ozone is a naturally occurring form of oxygen and when we add it to our cleaning solution, it is a powerful cleaning and disinfecting agent. It is non-allergenic, environmentally friendly and 100% safe. As an added bonus, Durashield protector is always applied as we clean to ensure your carpets stay clean up to three times longer than any other method! The Oxy-Dry® cleaning solution provides cutting edge technology with exceptional anti-resoiling and anti-wicking properties. It is highly concentrated to remove large amounts of soil. It will remove sticky residue from soda spills and previously applied cleaning products with no unpleasant chemical odour and leaves no soil attracting residue behind. It’s convenient as carpets normally dry in an hour or less even in winter. The system is quiet and non-disruptive. There are NO hazardous hoses, security or HVAC issues as a result of open doors. All of our equipment comes inside with us. Our cleaning solutions are odourless and contain NO VOCs. We’ll include everything for a professional clean of your carpets and furniture, giving you lasting value!